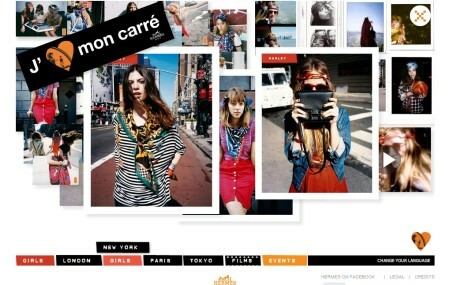 Although Hermès’s street style website J’aime Mon Carré (I Love My Scarf) has been around for a few weeks now, we’ve waited to report on it until we could see how well it was received. Unsurprisingly, some in the industry are quick to accuse the French giant of having aped Burberry’s Art of the Trench concept. 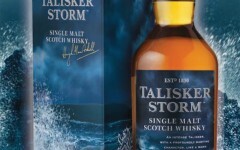 But, the idea was too good to not be imitated by other heritage brands which dominate a product category with an iconic item. The irony is that Hermès’s site may actually be more commercially successful than the pioneers at Burberry for one simple reason. The Hermès foulard scarf is its entry level item, one of the cheapest in its product range, while Burberry’s trench is one of its most expensive. The hip, young and sometimes even grungy glamour girls appearing on J’aime Mon Carré are a clever way for Hermès to engage with a new audience who may not have had the courage to walk into an Hermès boutique before or who perhaps thought the brand was for an elderly aunt. It is targeting the mass luxury segment by persuading very young women to see the scarves in a new light – young women who know that if they save their pocket money for a few months, they can actually afford to buy one too. “It’s about time,” says the WWD reporter who revealed American Vogue’s relaunched site, “the world’s most influential fashion magazine is late to the online game.” After what was barely a skeleton for a year, and before that a mere tagline on its sister site Style.com, Vogue’s new home is far more substantial. Some standout features include an oversized features carousel at the top of the site which mixes editorial seamlessly with ads, a locking navigation bar and generous photo size as well as lots of what the editor calls “breathing room”, meaning white space in the design. In related news, later today, Vogue will also unveil its first iPad app along with a new iPhone app for GQ. It has been reported that research conducted by the magazines’ publishing group, Condé Nast, for the iPad launch says that 50% of its magazine readers have “some first-hand experience of the iPad” so it’s no surprise that the group has finally gotten more aggressive with developing digital applications. 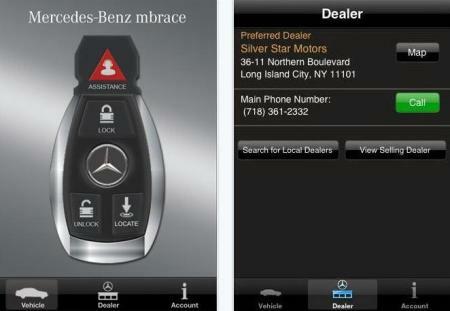 Introducing the carmarker’s ‘Mobile Concierge’ service, which includes enhanced Roadside Assistance services, the new version of Mercedes-Benz’s Mbrace application adds a host of new features that have been made possible via location-based technology. Drivers who have downloaded the app will be able to use their phones to unlock their vehicles, locate them in a parking lot and find nearby dealerships. 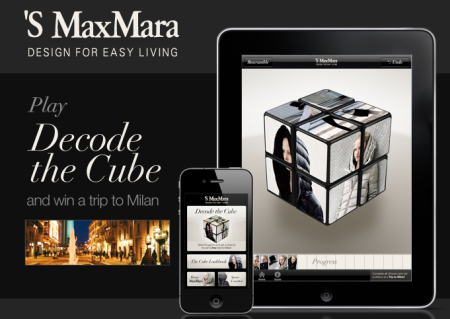 Max Mara used Vogue magazine’s Fashion’s Night Out event last week in New York to launch a new iPad game application called Decode the Cube, which is a bit like a simplified version of a Rubik’s cube. How the firm added a little weight to what might otherwise be a gimmicky digital product is that, first, it used the opportunity to promote one of its lesser known diffusion lines, ‘S Max Mara. And secondly, in order to access the game, users had to sign up to “like” the brand’s Facebook page, thereby increasing its followers. But most crucially, the game has a tangible Max Mara prize. Winners are eligible to enter a sweepstakes for a coat and a trip to Milan. 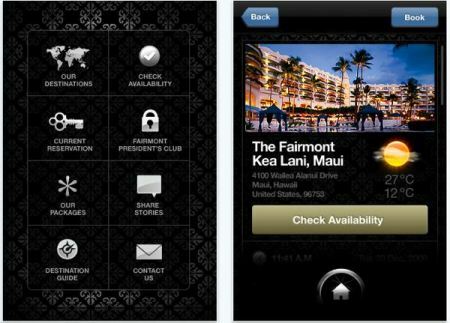 In addition to an online reservation service, which has become a standard feature of hotel apps, one neat addition to Fairmont Hotels & Resorts new iPhone and iPad app is the Destination Guide feature, which uses the GPS capability to give exact walking and driving directions to help guests find restaurants, events and other attractions near the hotel. Gucci’s CEO is certainly a devoted convert to the power of luxury ecommerce. “The destiny of the gucci.com digital flagship store is that it will become our highest-volume store in the world,” he said at the launch of the firm’s newly designed site. Gucci’s creative director Frida Giannini, was heavily involved in the project and had been working on the site for a year and a half. By dubbing it a ‘digital flagship’, Gucci seems to be highlighting their emphasis on mirroring the site against the design and experience of their bricks and mortar shops to create an environment that is familiar to its customers. But while it has used many of Gucci’s signature retail colour schemes, motifs and textures, it is a highly functional and user-friendly site linked to all the major social networking platforms and made compatible to the iPad. Some advanced features include the zoom which allows users to view products from multiple angles and from both the inside and out.